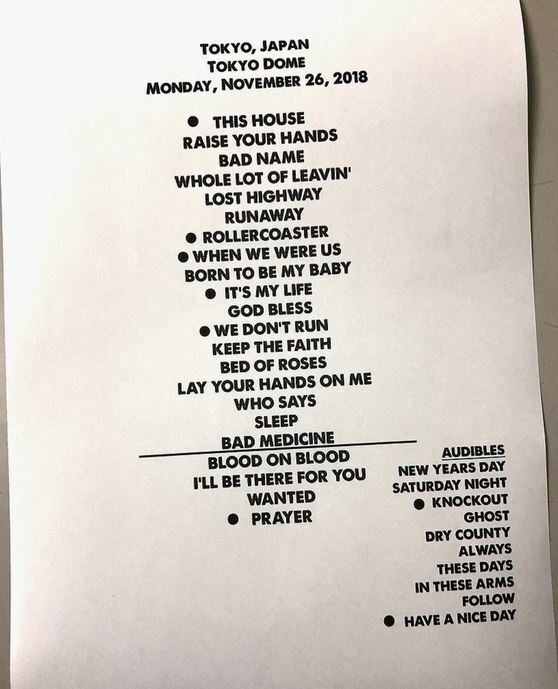 #63 - 2018/11/26 - Tokyo Dome, Tokyo, Japan - bjtourss Webseite! The tour continues half a year after the last show in Montreal, Canada. Jon's voice still is in a bad condition and his movements are close to zero. I'll Sleep When I'm Dead is moved to the end of the set and This House Is Not For Sale opens the show. Raise Your Hands is added. When We Were Us replaces Because We Can. God Bless This Mess is added. We Don't Run replaces We Got It Going On. Bed Of Roses is added. We Weren't Born To Follow was just an audible and finally opened the encore. Who Says You Can't Go Home replaces New Years Day. I'd Die For You is dropped. In These Arms and (You Want To) Make A Memory are dropped.